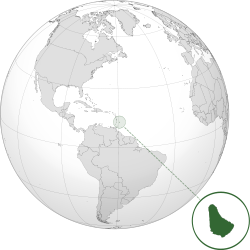 Barbados (pronounced /bɑrˈbeɪdɒs, bɑrˈbeɪdoʊs/ (deprecatit template)) is an island naition o the Lesser Antilles, 34 kilometres (21 mi) in length an as muckle as 23 kilometres (14 mi) in width, amoontin tae 431 square kilometres (166 sq mi). It is situatit in the wastren aurie o the North Atlantic Ocean an 100 kilometres (62 mi) east o the Windward Islands an the Caribbean Sea; therein, it is about 168 kilometres (104 mi) east o the islands of Saunt Vincent an the Grenadines, an 400 kilometres (250 mi) north-east o Trinidad an Tobago. Barbados is ootside o the principal Atlantic hurricane belt. Ance a Portuguese territorial possession kent as Os Barbados, in 1625 it became an Inglis, an later a Breetish, colony. The island haes an estimated population o 275,338 fowk, wi aroond 80,000 livin in or aroond Bridgetown, the lairgest ceety an the kintra's caipital. In 1966, Barbados became an independent naition an Commonweel realm, retainin Queen Elizabeth II as Heid o State. Barbados is ane o the Caribbean's leadin tourist destinations an is the maist developed island in the region, wi an HDI number o 0.788. ↑ "Barbados – General Information". GeoHive. Retrieved 16 December 2013. ↑ 3.0 3.1 3.2 3.3 Barbados, International Monetary Fund. ↑ "Barbados". 29 August 2006. Archived frae the oreeginal on 15 October 2007. (fco.gov.uk), updated 5 June 2006. ↑ "Barbados country profile". BBC News. July 23, 2011. Retrieved 28 April 2011. ↑ Staff (2008). "Places of interest - BRIDGETOWN". Government of Barbados. Wikimedia Commons haes media relatit tae Barbados. This page wis last eeditit on 30 August 2018, at 13:18.